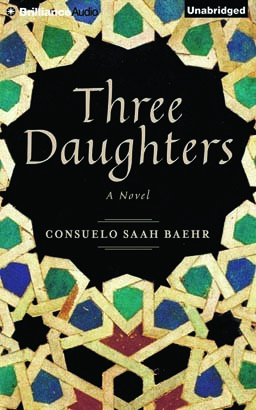 From the fertile hills of a tiny village near Jerusalem to the elegant townhouses of Georgetown, Three Daughters is a historical saga that chronicles the lives, loves, and secrets of three generations of Palestinian Christian women. Born in rural Palestine, just before the dawn of the twentieth century, Miriam adores her father and is certain his love will protect her, but she soon finds that tradition overrides love. Uprooted by war, Miriam enters a world where the old constraints slip away with thrilling and disastrous results. Miriam’s rebellious daughter, Nadia, is thrilled with the opportunity for a modern life that her elite education provides. But when she falls in love with an outsider, the clan reins her back with a shocking finality. Nijmeh, Nadia's daughter, is an only child and the path her father, the sheik, sets for her is fraught with difficulties, yet it prepares her for her ultimate journey to America, where she finds her future. Each woman, in her own time and in her own way, experiences a world in transition through war and social change…and each must stretch the bounds of her loyalty, her courage, and her heart.